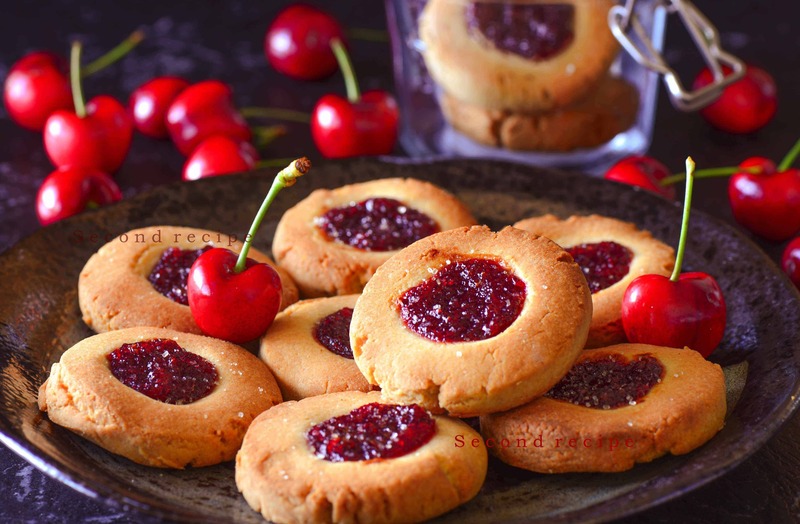 Eggless Jam drops are one of the easiest cookies which you can bake Oven fresh yummy strawberry/cherry jam filled biscuits ..yum. They are just what you need when you want a pick me up.Hence,whether you like to enjoy biscuits with tea/coffee or just as a snack,they are your best bet.They just melt away after crispy crunch.For those who are unfamiliar with them,jim jam will ring a bell.So eat make merry and enjoy! Best part about this recipe -no preservatives of the market made biscuits.No additives or coloring agents,no caking agents ! Alternatively you can use any market based fruit jam also.Also,you may use any homemade jam.You can make many batches with different flavors.Serve it to a huge gathering of hungry kids. Just some heavenly smell in your kitchen and as a result,loads of compliments from your loved ones. May be all you need after a long week at work! Slice the cherry or berries into half,add sugar to it. Cover the bowl with a lid and keep it aside for 6-8 hours. In a pan heat the mix for 20 minutes on low flame or untill it dries to make a jam. Let it cool and process it in a food processor. Mix all the ingredients and knead them in a dough. Cut them into desired shape using cookie cutter. Press in the center with a thumb to make space for the strawberry jam. Place them on the baking sheet. Fill strawberry jam in the center of the cookies. Click cake for more cookies and cakes. Click here to have a look of all our videos.